Impelled by a desire to free themselves from the German influence that had dominated the development of Estonian literature, and from the one-sided relation of cultural dependence that had lasted several hundred years, the Young Estonia movement sought to modernize Estonian literature through borrowing from other European literatures, in particular from French, Scandinavian, and Finnish. This article seeks to clarify the relative importance and selection criteria of translations from German literature for the literary field of the Young Estonia era. Further, I seek to elucidate Young Estonia’s contribution to the renewal of these selection criteria in the first, but more importantly the second decade of the 20th century. The long list of translations from German to Estonian at the beginning of the century speaks of the ”light Muse” of German family newspapers, with an admixture of the following: naturalist light fiction with a social theme and social drama; the historical novel (great favourite of the era of historicism), trendy fiction for both feminine and masculine audiences, and an overwhelming proportion of ”Heimatskunst” (literature of local colour). In the first and second decade of the new century, new names appear on the Estonian literary scene that signal a change in taste. For example, naturalist authors (Kretzer, Hauptmann, Halbe, Dehmel) crop up sporadically amidst texts meant for leisure reading. Although the first translations of Nietzsche only appeared in 1901, already in 1902 critics had reason to speak of ”Nietzsche in Estonian literature”. 1910 marked the breakthrough of Viennese modernism in the Estonian literary field (Schnitzler, Altenberg, Bahr). Under the influential protection of the Young Estonians (Suits, Kallas), and published by the Young Estonia Publishing House, Baltic German novellawriter Eduard Keyserling enters the Estonian literary scene. Though ”mass consumption” literature from Germany continued to be disseminated through serialization in Estonian newspapers, thus continuing to mold the taste of the Estonian petite bourgeoisie, Young Estonia’s authors, critics, and publications introduced the Estonian public to new directions and names in German letters. At first the choice of translations did not coincide with Young Estonia’s program of ”art for art’s sake”. Young Estonia’s ideal, symbolist literature was connected in Germany primarily with names such as Rilke, Hofmannsthal, and George. During the Young Estonia era, these writers do not figure significantly in the Estonian literary field, though George emerges as a great model for newer Baltic-German poetry. Translations of these poets do not appear until the 1920s. However, the preparatory work done by Young Estonia should not be underestimated. 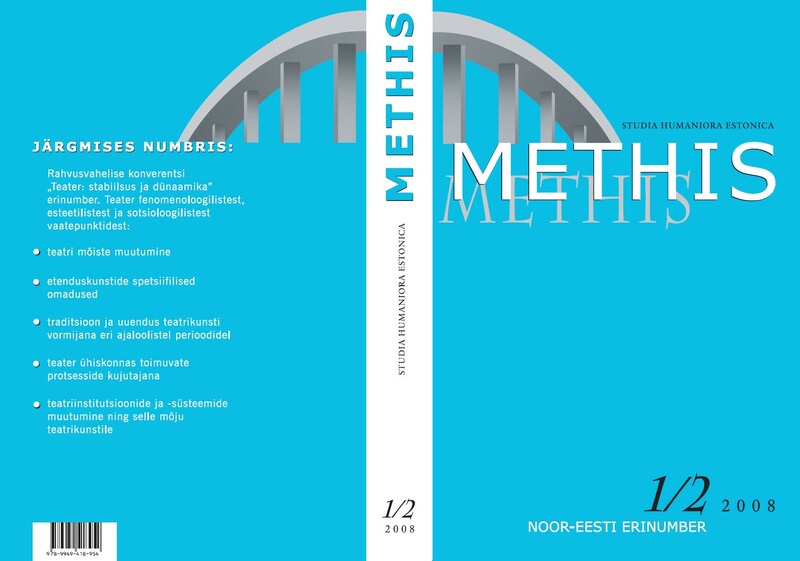 Due to the circulation of literary influences throughout Europe, it is difficult to ascertain specific influences of German modernism on the authors connected to Young Estonia. The reliance on German sources in the literary criticism of the first decades of the 20th century, Young Estonia included, is striking. A. H. Tammsaare’s reading notes locate the sources of his philosophical foundation and sensibility primarily in German modernism. More generally speaking, Nietzsche’s shaping role is crucial, as was true more generally, both in European and Russian literature; Otto Weininger also had considerable influence on Estonian literature. The elective affinity of Jaan Oks with German expressionism is striking as well –an affinity so early and so spontaneous that this is probably not a case of direct influence. The German expressionist avant-garde, which began to define itself through declarations, theses, programs and groupings around 1910, become an important source of impulses in the Estonian literary field in the 1920s, especially through the mediation of Marie Under.